1.Please connect Bluetooth and match car radio frequency before playing songs from your cellphone or tablet. 2.Please adjust station when you get static issue/ FM signal gets interference. 3.It auto-pairs with your phone as long as my phone is already in range when it turns on. A: Plug the FM transmitter into your car's cigarette lighter or power socket. B: Connect Bluetooth of mobile phone and then choose "C26S". 9.Transmits music from your phone to your car system via Bluetooth. 10.This car charger adapter is compatible with any Bluetooth enabled devices. HANDS-FREE PHONE CALL FEATURE: This car charger built in microphone. You can easily answer/ reject/redial calls and play/pause songs by pressing the phone button while listening to music. There is a button above the phone button that will go to the next track and it turns the volume/frequency up. The button below the phone button will go the previous track and also lower the volume/frequency. BLUETOOTH FM TRANSMITTER: Car charger works great for transmitting audio from your phone to the radio in your car. It picks up the Bluetooth signal and transmits the FM signal extremely well even from enclosed location. The sound would be better if you tune the channel to 106.0~108.0MHz. 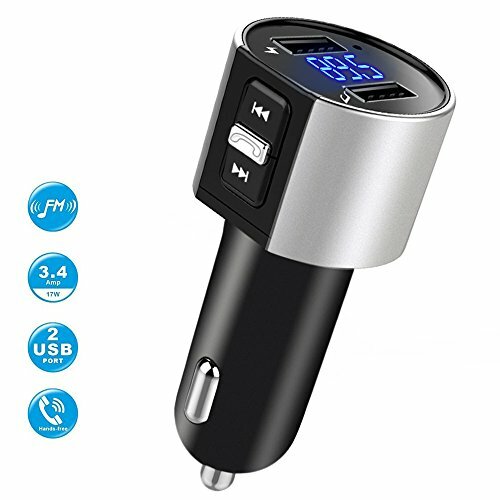 This bluethooth fm transmitter is a wonderful car gift for you, your friends and families to listen to music, podcasts and audio books while driving. EXCELLENT STEREO SOUND & LED DIGITAL DISPLAY: Echo cancellation and noise suppression (CVC) technology which can offer your crystal clear calls, navigation and music. Imagine that play 2-3 songs on your way to work and back home. Cool blue LED digital screen displays FM frequency and car voltage. It has voice prompt when the car voltage is low. DUAL FAST CHARGING USB PORTS: This FM transmitter has 2 USB ports (5V-2.4A&5V-1A)for charging your phone or inserting a flash driver. You can upload songs to the flash drive and plug it in to the transmitter and listen to your music. It built-in smart charging IC, which can detect your devices automatically and ensure phone charging at optimal speed. UNIVERSAL COMPATIBILITY: Compatible with all Bluetooth enabled devices, such as, iPhone, iPad, iPod, Tablet, Samsung and Android Smartphones. Stream music and calls directly from your mobile devices to car stereo system via FM radio signal( 87.5-108.0MHz). It's a very cool solution for the vehicle which has no bluetooth or aux input. If you have any questions about this product by Bligli, contact us by completing and submitting the form below. If you are looking for a specif part number, please include it with your message.